Hi there! I hope you all had a happy, healthy and safe New Years- Welcome, 2014! Wowzers. I know I say this a lot, but my “Sunday Meal” this week was seriously good. Like, so, so good. I blame it on the Laughing Cow cheese sauce. My mom is a lover of white sauces, and while I enjoy them, they aren’t the first thing I think of when I want a “sauce” for my meal. However, when I thought about the ingredients in this meal, I realized a white sauce would be perfect. My idea for a white sauce was amplified when I opened my fridge and saw the sun-dried tomato Laughing Cow cheese wedges she had given me. Bingo! Combining those with skim milk would be the perfect “white” sauce. 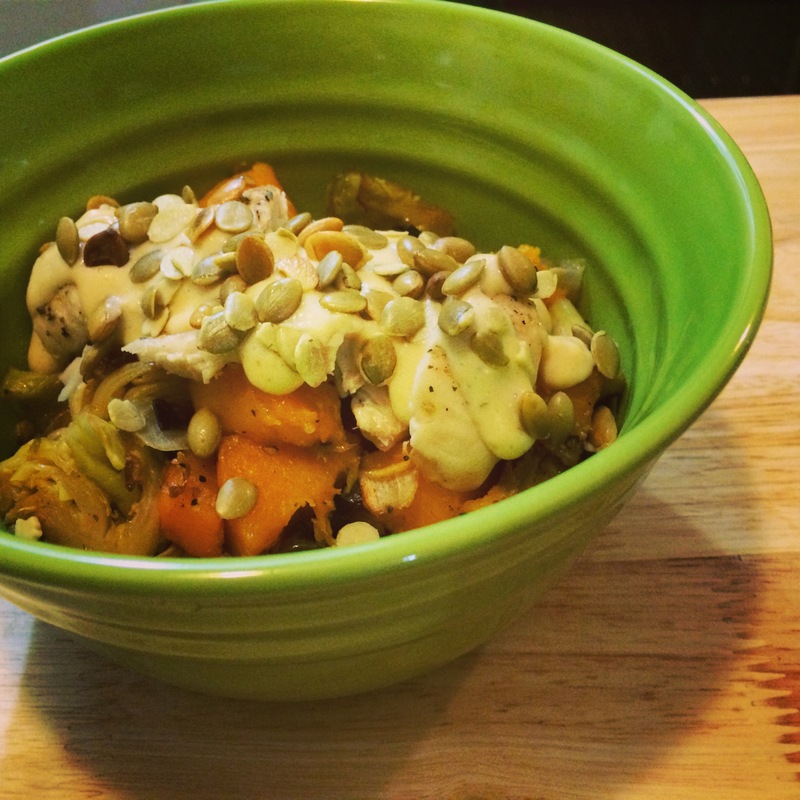 In addition to the cheese sauce, I have recently become a huge fan of dishes with Brussels Sprouts and butternut squash in them. My sister found a recipe including those veggies that we made for Thanksgiving and it was SO good. I loved roasting the two together for this meal (with onions, because onions make everything better), and am not sure why I don’t roast veggies more often. It’s so easy and such a nice thing to have around the house throughout the week. 1. Pre-heat oven to 375*. Cook the quinoa according to the package. 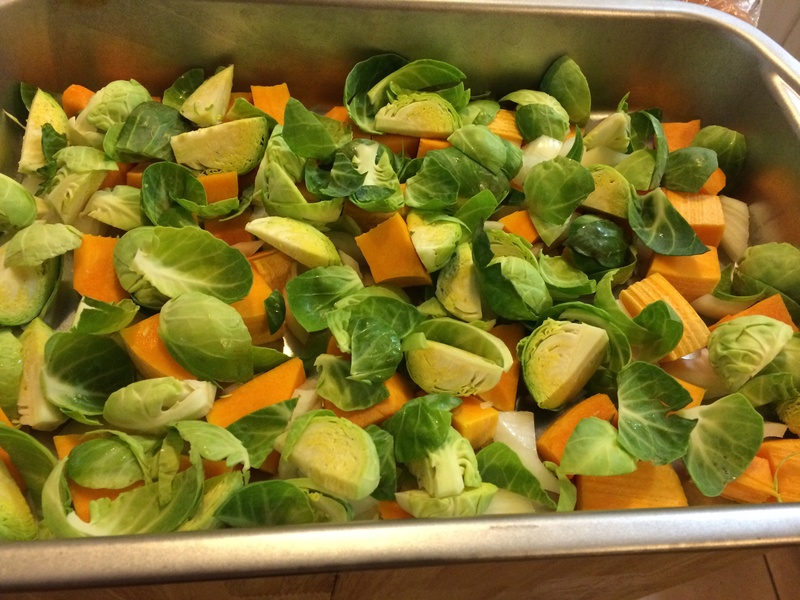 While that is cooking, cut your Brussels sprouts, butternut squash and onions and place on a baking sheet. Coat with EVOO (however much you want to use), salt & pepper and herbs and seasonings. Bake for 30-40 minutes, stirring occasionally, until the squash is soft and cooked through. 2. Prepare your chicken (I sprinkled salt, pepper and seasonings) and be ready to place that in the oven when you have about 15 minutes left on the veggies. 3. Place the Laughing Cow wedges into a small sauce pan (how cute is this one that my mom got me? It’s so little! )- I used 2, just as an FYI. As they start to melt, add in your milk. I started with 2 tbsp. and added more in gradually as necessary. Make sure you whisk continuously so as it doesn’t burn! 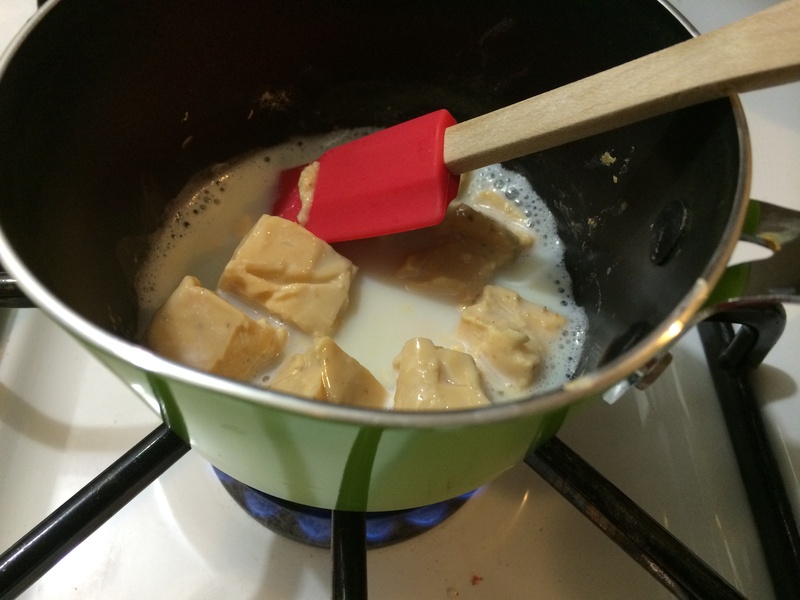 Once it’s thickened up a bit, remove from the stove. 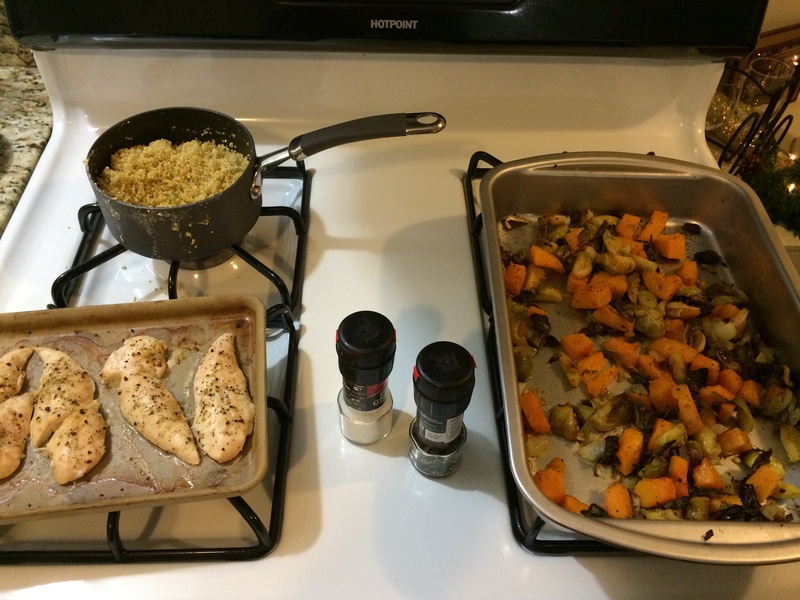 At this point, your quinoa should be done, so place that in a bowl, top with the roasted veggies, chicken and sauce. 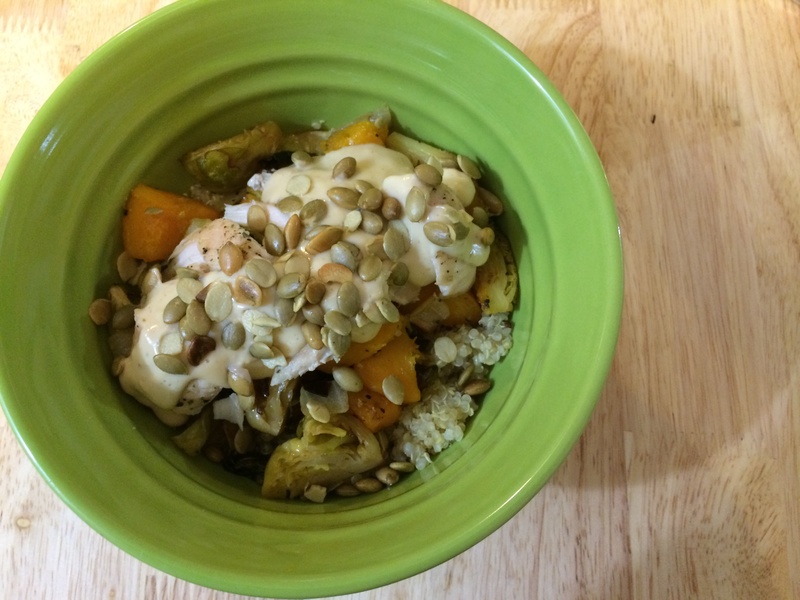 I forgot to say that I added some pumpkin seeds to the top, which provided a nice little crunch to the meal! If there’s one thing you make out of this recipe, please have it be the sauce… and roasted veggies! 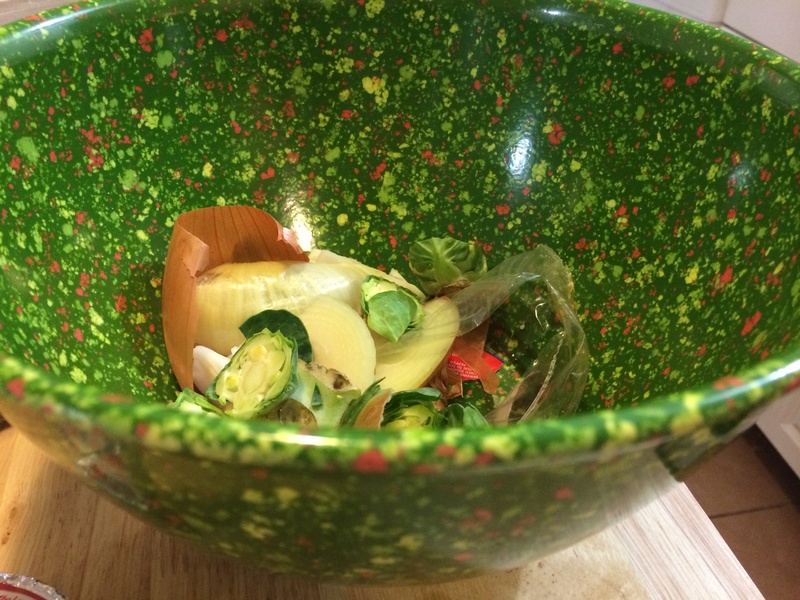 Lastly, I wanted to thank my mom for this awesome Rachael Ray Garbage Bowl– it is perfect for me because I usually just use a plastic bag to collect trash as I cook (I hate making multiple trips to the trash can- interrupts my flow! ), which can be wasteful. This is the best replacement, not to mention it’s pretty to keep on the counter! 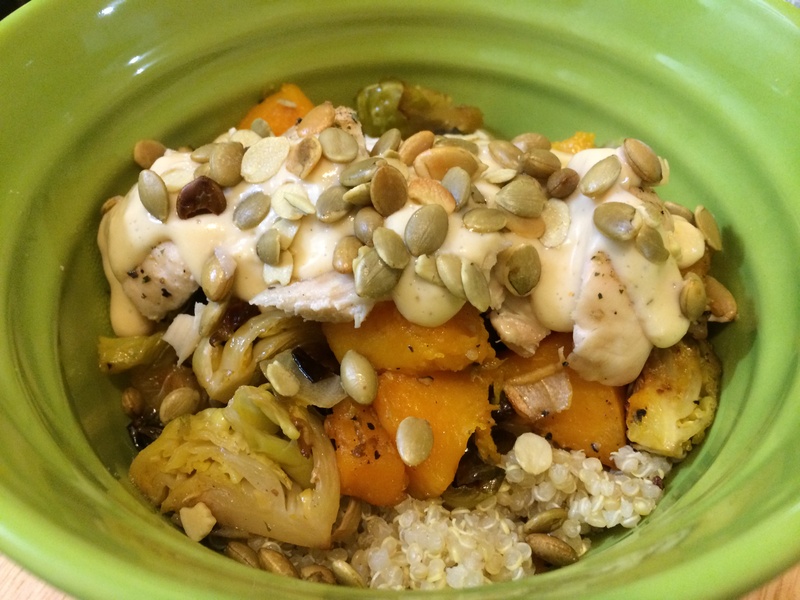 And, there you have it- a healthy, easy and delicious meal! Questions for you: Do you like cream sauces? Brussels sprouts- love ’em or hate ’em? Do you own any Rachael Ray dishware? I haven’t had Laughing Cow cheese in forever! Also, I love your apron. Me, either! I forget to buy them, but my parents always have some so I was happy to take a few off their hands. 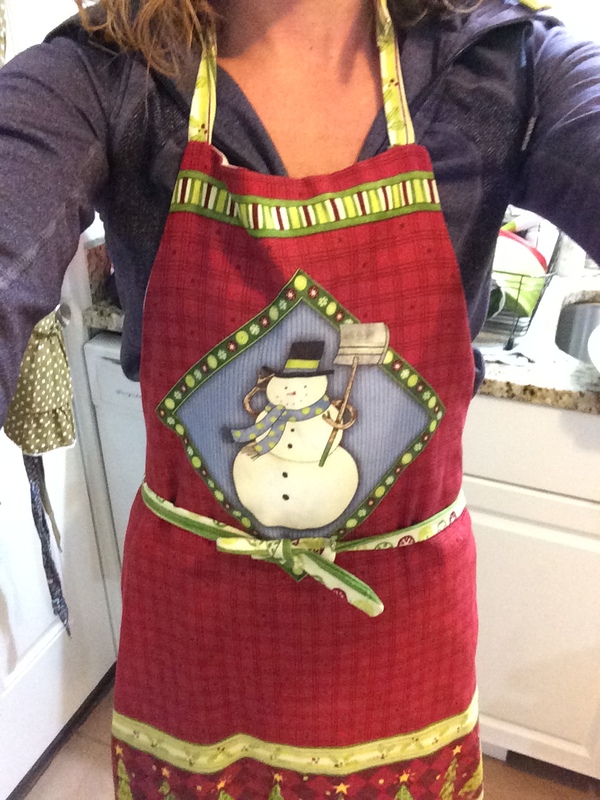 And, thanks- I love aprons! I will be making this soon–I love all the things especially the sprouts –I have started roasting them and they are so good. Thanks for the recipie. My pleasure, Jean! Roasted Brussels Sprouts is one of my new favs- definitely a yummy meal!